This week’s OH!Chart results were quite an even spread throughout the nominees. Idol groups and soloists battled it out for podium spots, but there was one stand-out winner. 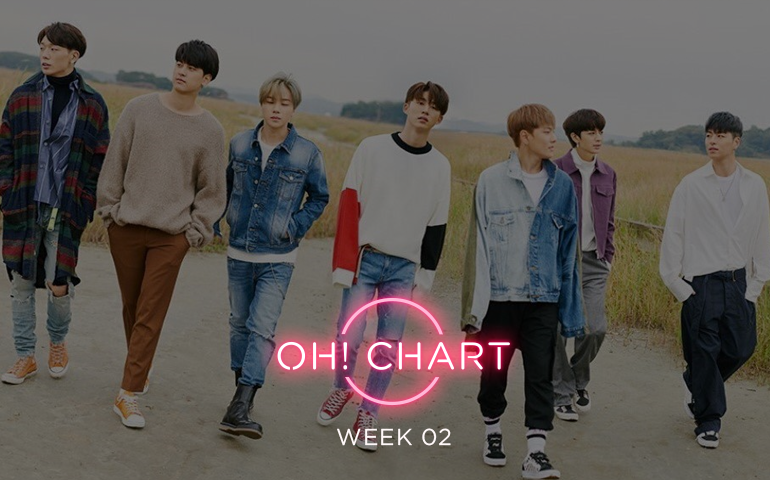 YG Entertainment’s iKON has claimed back-to-back OH!Chart wins for the first time for “Love Scenario” on 18.85 points. Rookie girl group Momoland took out second place with “Bboom Bboom” on 15.97 points. Leading girl group Red Velvet rounded out the top three with “Bad Boy” on 11.06 points. Momoland dominated the physicals category after selling 9211 copies. Newly-debuted boy group Target came second with 5000 copies. Seventeen wrapped up the podium spots on 2148 copies. iKON’s second win was confirmed with a first place finish in the digital scores on 58,068,579 hits. Soloist Roy Kim came second on 50,867,944 hits for his new ballad, “Only Then”. Veteran artist Jang Deok Cheol took out third place for “Good Old Days” on 40,569,860 hits. In the OH! category, iKON again finished first with 60 votes. Red Velvet came second on 34 votes. Momoland and Seventeen tied for third place on 18 votes each. Hip-hop group iKON’s “Love Scenario” is a sweet, medium tempo song filled with boyish vocals and laid-back rap. The song’s young love theme is very pleasing to listen to and watch in terms of the simple yet meaninful scenes. The choreography is well-thought out as well, especially with the circle formation that appears mid-way. Overall, it is a chilled track that is highly addictive to the ears. Can iKON win their first triple crown? Will soloists take the podium spots? Or will there be a debutant taking the win? Let us know your thoughts below!